There’s more to being a professional painter then just painting. In fact, most professional painters spend as much time preparing for the job as they do actually paining. Taping off borders, setting up scaffolding, laying drop clothes, and other similar tasks often take up more time than applying the paint itself. Furthermore, if you were to ask professionals their least favorite part of preparing to work, you would hear the same answer from most: stripping paint. Stripping paint is tedious and time consuming. More importantly, it can be very dangerous. The tools utilized for stripping paint and the mess created by the process can create hazardous conditions that must be addressed. For example, continual or prolonged exposure to lead paint can lead to health problems and illness for professional painters. Even paint that is not lead-based can pose a risk, as small paint particles can make their way in to the eyes and lungs of painters. As a result, it is imperative that precautions be taken every time paint is stripped to protect the health of the person doing the work and the client who will be using the space in the future. Today we’ll examine the different ways to strip paint, the dangers inherent in paint stripping, and the steps that paint professionals can take to make to ensure proper safety measures and avoid the health risks associated with the tools and materials needed to strip or remove paint. The first question many people ask themselves when starting a paint job is, “Why should we strip the old paint off? Why don’t we just paint over the old paint?” Painting over old paint can lead to chipping, bubbling, or an uneven finish. The new coat of paint won’t strengthen the older paint beneath it, which will still be susceptible to flaking off. Furthermore, color and thickness can be difficult to control if new paint is being applied to an old coating. While stripping paint adds substantially to the work involved, getting top notch results can only be accomplished by not cutting corners. Your clients will be much happier with your work if you strip the old paint off and apply the new paint to a naked substrate or surface. Paint stripping can be accomplished in a a number of different ways. In many cases, applying a chemical paint stripper will help loosen the paint from the substrate. Once this chemical has penetrated the paint, a wire brush, scouring pad, or paint scraper can be used to remove the paint. Paint can also be stripped by applying heat to the paint with an electric paint remover. Holding an electric paint gun three to four inches from the surface should heat the paint up to a temperature that will cause it to release from the substrate. 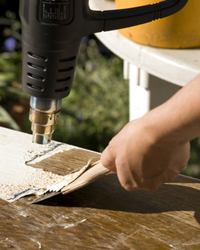 Medium grit sandpaper can also be used to remove paint from wooden or metal surfaces. The options available for removing or stripping paint are varied and should be chosen based on the type of paint and type of substrate you are working with. For example, paint stripper works excellent on stone and concrete while electronic sanders do well with wood. Painters can protect themselves from the harms associated with paint stripping in a few different ways. The first order of business is to understand what type of paint is being stripped. Does it contain lead? Is it on a surface likely to release the paint easily like wood? Or is it on a surface like sheetrock that is unlikely to allow for stripping at all? If you are stripping paint, you must take precautions to protect your skin, eyes, and lungs. Hands can be protected with plastic gloves, while a full-body suit should be used when stripping paint in a large-scale commercial setting or when using paint stripping chemicals. Safety goggles or glasses (at a minimum) should be worn at all times in the paint process to keep loose paint flecks or dangerous chemicals from coming in contact with your eyes. Perhaps most significantly, a dust mask or respirator should be worn during the entire stripping process. If lead is present in the paint, then a mask with a rating of at least P100 should be worn. If using a chemical paint stripper, then a respirator that provides fresh air circulation should be utilized. While most of you know that proper air circulation while painting is critical to not only the drying process but also to your own good health, the same attention should be given to your air supply while stripping paint. The ramifications for professional painters are somewhat frightening. The dangers of either paint stripper vapors or microscopic particles of paint entering in to the lungs and circulatory system can lead to severe sickness, dizziness, headaches, coughing, and even death with prolonged exposure. The unfortunate thing is that many painters don’t realize the damage has been done until it is too late. Many professionals that have been working in the field since before lead-based paint was outlawed are starting to feel the health effects associated with the long term exposure to toxic paint products. It is up to the next generation of painters to take the proper precautions now and in the future to make sure these health problems don’t continue to plague paint professionals. Click here to learn more about environmentally friendly paint products that have the added benefit of not posing health risks to the modern paint professional.